The TCGCO Guillotine Chop-off Attachment is available for the the TCDRB Turf Multi-cutters. This power driven attachment chops the cut turf (sod) to precision pre-set lengths for easy handling and re-turfing work. 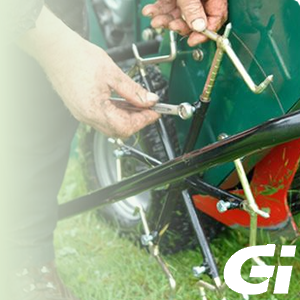 Blades are available for use with this attachment to cut sod up to 50cm (20") wide and the chop can be set to cut from 1 metre (100cm) to 5 metre lengths. The Wedge Insertion Blade cuts a single slit in the ground which is separated by the wedge portion of the blade to a width of 32mm (1 1/4") to enable the insertion of Pipe, Wire or Materials down to a maximum depth of 10cm (4"). This blade is used with the Reel Insertion Attachment (RIA) to trench insert in a one pass operation. The model TCCRIA Reel Insertion Attachment is available for use on the Groundsman TMC range of Turf Multi Cutters. Cable can be inserted down to a maximum depth down to 10cm when used on the TMC48, 7cm on the TMC46 and 5cm on the TMC26 machine. It is only suitable for low voltage applications such as for robotic mowing signal wire, low voltage lighting or cable TV installations on caravan parks etc.The cable is inserted in a one pass operation using the patented soil displacement Wedge Blade. The attachment comes complete with a quick detachable cable reel and mounting bracket. The whole operation is fast and hardly visible on the surface when complete and can be used for a whole range of applications. The model TCPRIA Reel Insertion Attachment is available for use only on the Groundsman model TMC48 Turf Multi Cutter. The attachment will insert 16mm dia hose pipe such as dripper-line irrigation pipe to a maximum depth of up to 9cm in a one pass operation using the patented soil displacement Wedge Blade. The attachment comes complete with a 100 metre pipe reel and mounting bracket which incorporates an adjustable over-run brake. The whole operation is fast and hardly visible on the surface when complete and can be used for a whole range of applications. The Trench Plough is an attachment for the TMC46 Turf Cutter that follows the trench blade to remove a strip of sod (down to 5" / 120cm depth), placing it at the side of the trench.